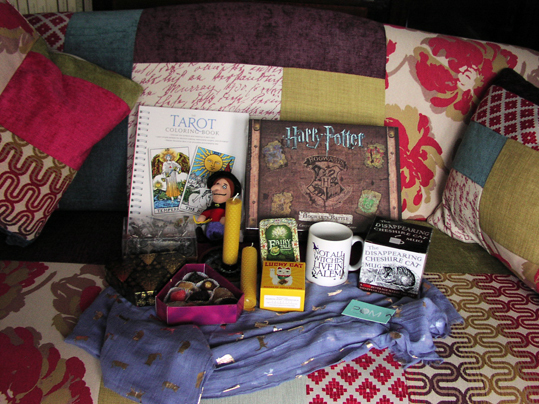 A bad witch's blog: Lovely Presents: What I Got for Yule! Lovely Presents: What I Got for Yule! Oh and I also got some other chocolates and some booze, but they didn't make it to the photo. Sometimes at Yule one gets left with the dilemma of what to do if one is given a gift that one really doesn't want by a close friend or family member. It is very difficult - do you keep it because you don't want to offend them, or take it to the charity shop where it can be hopefully enjoyed by someone else and raise a bit of money for a good cause? Luckily this year I don't have that problem, because all of my gifts were lovely. Thank you so much to my lovely friends and family!